The Battle Creek region has a strong history, but there isn't any place where one can go to see the history of the region. The Battle Creek Regional History Museum will change that once it is complete. A regional history museum has been a dream of the community for many years. The Battle Creek Historical Society met in 1916 and planned to have a museum. A History Room at the Battle Creek Tower was planned in 1931. Neither of these places were ever developed. The Battle Creek Regional History Museum has been in the planning stages for seven years. It is getting closer to being a reality. Board members have been in place, a location has been secured, and fund raising efforts are underway. The museum will be at 307 W. Jackson Street, Battle Creek, Michigan in a building that was once the Battle Creek Equipment Company. Phase One of the project will be on the lower two floors of the 3 story, 49,000 square foot building. Extensive renovations to convert a manufacturing plant into a museum will be needed. The board will be seeking accreditation from the American Alliance of Museums. One of the goals of the museum board is to lead efforts to form a coalition to promote and offer connected museums throughout the region. Although the physical location will be in Battle Creek, the museum itself will showcase the rich history of the area. The opening date is yet to be determined but the board members are optimistic that one room will be ready sometime in 2015. Future development will include research area, multiple display areas, and a gift shop. Two board members spoke to my local genealogical society and conducted a survey asking for attendees input. We ranked what we felt should be included in the museum. Areas under consideration include business history, Kellogg Brother's history, farming history, military history, cereal history, manufacturing history, Federal Center history, Sojourner Truth and Underground Railroad history. We were asked for input on what displays we would like to see in the museum. I am looking forward to seeing the museum develop. I think it will be a great addition to the local area. 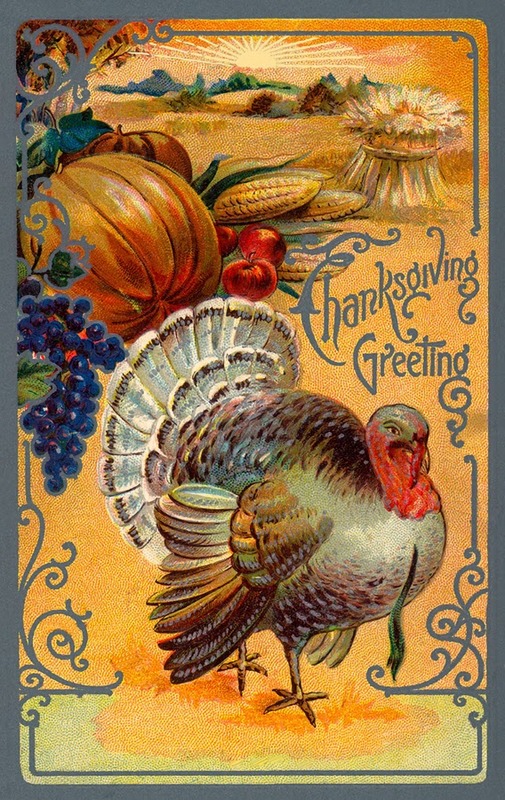 I would like to wish my United States readers a very Happy Thanksgiving. I hope you are surrounded by family, friends and food. I will be spending the day with my husband, parents, daughter and son-in-law this year. My daughter and I will be preparing the feast. I have written before about my Pilgrim ancestry and I thought I would share a few Colonial American Genealogy resources. I am sure there are many other great resources for Colonial America research. If you have a favorite, please share in the comments section. "First, do NO harm" are words every genealogist should remember when conducting research, whether one is in a library, archive, courthouse or cemetery. Those words are especially important when visiting a cemetery. Many gravestones are in delicate condition and all efforts should be made to maintain the condition of the gravestone and keep it available for generations to come. The Michigan Genealogical Council (MGC) addressed this issue in its fall newsletter. MGC publishes a newsletter four times a year that is available on their website for anyone who is interested in reading it. The newsletter covers items pertinent to societies and genealogists. It shares information on Michigan genealogical resources and events, articles from its member societies and other items of genealogical interest. The article, Gravestone Cleaning and Restoration, was a timely article for our society, Calhoun County Genealogical Society, which I am the President of. Last year, our society had a presenter who talked about cemeteries and wasn't concerned if he did any damage to them as he had gotten the information he wanted. I cringed when I heard that. Luckily, someone asked a follow up question about the best way to take care of gravestones and we were able to minimize the damage, in my opinion, of the speaker. Even though we addressed the issue at another meeting I never felt that we provided enough information for our members. 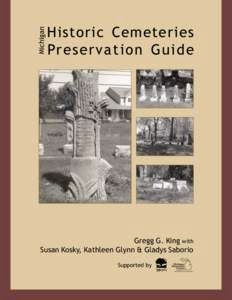 This book addresses many aspects of preserving historic cemeteries. The 200 page book addresses organizing a project, surveying a cemetery, documenting your work, mapping a cemetery and more. Chapter 3 centers on the actual cleaning and repairing of the gravestones. Included in the book are appendices of forms, definitions, organization abbreviations, Latin phrases, symbols and more. I was so impressed with the well researched book that I shared it via email to all our society members. The information is too important not to. Be sure to take a look at the guide, you won't be disappointed. Each week, New England Historic Genealogical Society, NEHGS, has a survey in their The Weekly Genealogist newsletter. The results above were published on November 19, 2014. I am in the 51-75 category or 6% of the 4131 respondents. I love books and keep a wish list of books I would like to get as gifts. I wrote about my genealogy library and how I keep my costs under control in February. I am still practicing those cost savings today. It has been harder as I have noticed over the last couple of weeks that many genealogy companies have been having sales on books. I have had a hard time controlling myself. I have been adding to my wish list instead of buying them for myself. I have been asked if I read all of the books I have. Yes, I do! I keep the ones I haven't read on a separate bookshelf and after I read it I put it on my genealogy bookshelf. Currently, I have two books to read and one book to finish. When it comes time to conduct research, I will pick a book to use depending on my area of research. For example, when I am doing German research I will have four or five books on my desk. One might be a general research help book, one a map book, another has a list of online resources, a German dictionary and so on. I don't know if Santa will bring me any of my wish list or not. Santa may think it isn't a very good gift, but it is. I pour over the NEHGS gift catalog like I use to poor over the Sears Christmas catalog! I read every entry and circle ones I would like to have. 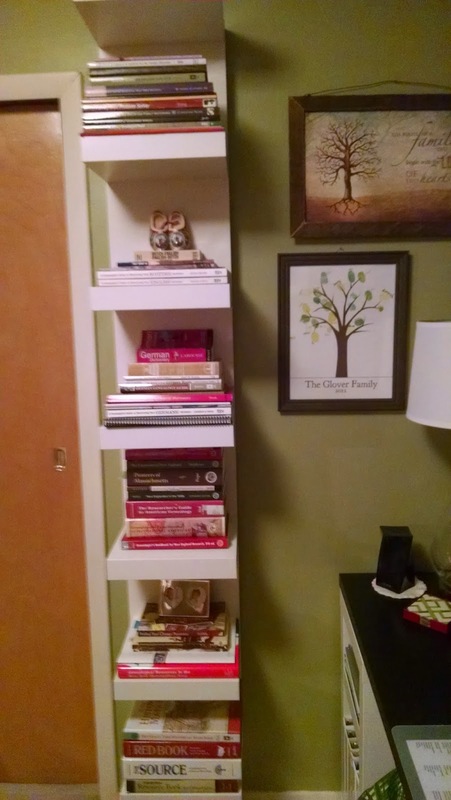 If you are curious about what books I have in My Library check the pages at the top of the blog. I have recently updated it. A couple of months ago I was contacted by Nora about starting a genealogy blog. She had some questions about how to get started with setting up a blog, layout, etc. I was happy to help her through the process and after a few emails and a lot of work on her part, Nora has a wonderful, genealogy blog: Bridges to Yesteryear. Nora is a blogger from Michigan, my home state, and writes about her family. The surname "Bishop" is the first line of her family she is concentrating on. Nora shares land records and deeds; probate records, biographical sketches, Bible records, timelines and more. In addition to sharing the records, she provides a source for those records. I encourage my readers to take a look at Nora's Bridges to Yesterday blog and leave a comment welcoming her to our great genea-blogging community. Welcome, Nora! I look forward to seeing your blog develop and reading more about your family. Census records are some of the first records I search for when researching an ancestor. I have been doing a series of Where in the World? posts in table format to see where there are gaps in my research. This table is for Sarah/ Sally Jackson McGee, my paternal, second great grandmother. She is the daughter of William Jackson and Isabella McClenahan. She married Richard McGee and is the mother of four children: Katherine (my great grandmother), Isabella, William John, and James. One of the best things about blogging is the contacts you make through your blog. The posts I have received the most emails about are the ones I wrote about the German POW's buried in Fort Custer National Cemetery in Augusta, Michigan. I have been contacted by researchers; family members of those buried, who are living in Germany now; and historians. I enjoy this aspect of blogging very much. I have learned things from these contacts that I wouldn't have found out through my usual methods of research. I was pleasantly surprised when I opened my 'snail' mail one day and found a flyer about a new book that was being published. A sticky note was attached that said "I think you might enjoy this". It was from the author, Lynne Breen and the book was titled, "I'll See You Again, Lady Liberty". Lynne had included her email and I emailed her thanking her for thinking of me. Next, I asked if she or Mr. Floeter did any public speaking. At the time I was in charge of programs for my local genealogical society and I thought this would be an excellent topic to offer our members. Lynne said she would forward my email to Mr. Floeter and later that day I heard from him and we set a date for him to speak. I was so interested in his book that I ordered a copy to read for myself and I am glad I did. It is historical, autobiographical, funny, and well written. I'll See You Again, Lady Liberty: The True Story of a German Prisoner of War in America is written by Lynne Breen, but told by Ernst W. Floeter. The 107 page book is filled with stories of Mr. Floeter's life in Nazi Germany during the war, his time as a prisoner of war in the United States, and his decision to return to the United States after the war to make it his home. Ernst grew up in Stettin, Pomerania and details his life as a young boy in Hitler's Germany. He tells of his and his family's anti-nazi feelings during this time, including his mother making prank calls to the Nazi's. The book is told as if he was in the room talking to you. It is filled with warm stories of the love of his family during the turbulent historical times. He tells of living a normal life during very difficult times. His time in the German Youth and eventually, the German army offers an interesting perspective of the preparation for war that Germany made. Ernst, at one time, hoped he would be captured. He got his wish and details his time spent as a Prisoner of War. He was transported to the United States and spent time at camps in Michigan (Camp Custer), Illinois, and New Mexico. He tells of camp life, his love of candy bars, and his treatment by his guards. The way he tells of his travels lets the reader see what he was seeing on his travels from Germany, to England, and to the United States. 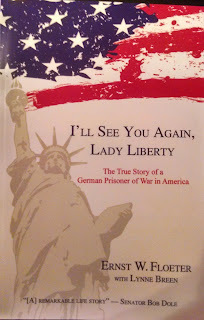 Ernst returns to Germany after sailing out of the New York Harbor promising Lady Liberty he would return, which he did. The last few chapters complete the story of Ernst Floeter, his marriage, family and the time he has spent living in Grand Ledge, Michigan, just north of Battle Creek. I'll See You Again, Lady Liberty is a well written book filled with interesting stories and great photography. It gives the reader a better understanding of war time in Germany and what it was like to be a prisoner of war on this side of the Atlantic. It allows the reader to see America through the eyes of a foreign born person. Mr. Floeter's love for his new country is a joy to read. If you would like to hear Mr. Floeter speak of his time as a prisoner of war, join the Calhoun County Genealogical Society on Tuedsay, February 24, 2015 at 7:00 p.m. in Marshall, Michigan at the LDS Church. 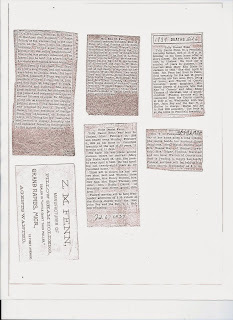 Page of obituaries from Huldah Rowley Fenn's Bible, click copy above to enlarge. Elizabeth Poor Fenn, who was married to Daniel C. Fenn, Huldah's son. 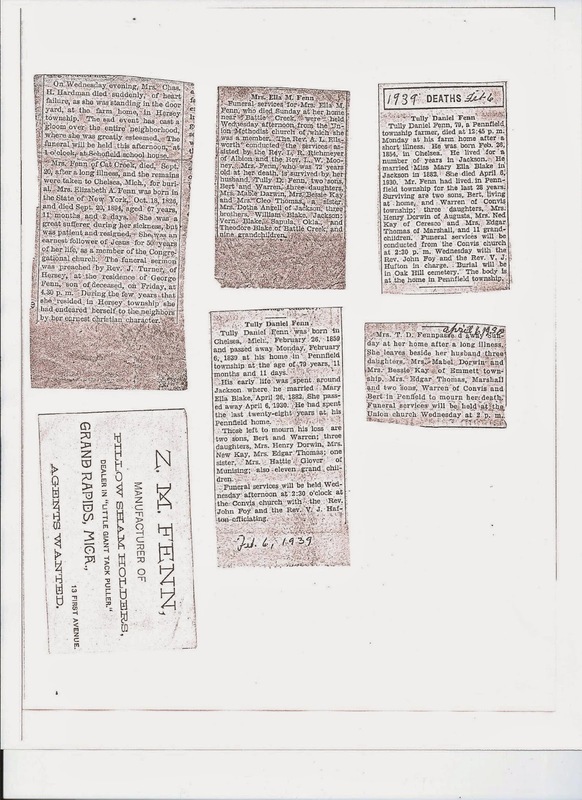 The last item on the page was a business card for Z. M. Fenn, Zealton Myron Fenn, Huldah's grandson, the oldest son of Daniel C. Fenn and Elizabeth Poor. I found the following pictures in the Glover and Blodget Family File at Ypsilanti Historical Museum Archives this summer. The files had a lot of Glover family photographs that I will be sharing in the coming months. The first two photographs are of Sarah Salisbury Glover who married Amos C. Blodget. Sarah is the daughter of Charles Williamson Glover and Mary Ann Powers. Sarah was named after her paternal grandmother Sarah Salisbury, who married Alexander Glover. Amos Blodget and Sarah Glover were married about 1852. The photographs were labeled with the spelling of Blodget with two 't's, many public records have only one 't' and I have chosen to use the one 't' spelling at this time. Source: "Hal W. Glover Buried in Highland Cemetery,"; folder: "Glover," Glover Vertical File; Ypsilanti Historical Society Archives, Ypsilanti, Washtenaw, Michigan. Many friends and relatives attended the funeral services Monday afternoon at 2 o'clock, at the residence for Hal W. Glover, who passed away at his home Saturday morning. Rev. David H. Porter of the Presbyterian Church conducted the services. The pall bearers were: three sons, Crary, Willis, and Paul, a son-in-law, Lorenz Kisor and Eugene Dodge and Charles Sweet. Orville Kersey, a colored boy who has helped Mr. Glover during his illness the past four years, followed the casket. Beautiful floral tributes expressed the sincere regard of his many friends and relatives. Relatives who came from out of the city were his son, Paul Glover and wife, Fayette, O. Two former business partners, James Duffin and Edward Durand, Cheboygan, and Mr. and Mrs. Ralph Hammett. Ann Arbor. Burial was in Highland Cemetery. Michigan Genealogical Council (MGC) and The Archives of Michigan holds a Fall Family History Event every year and for one reason or another I have not been able to attend. Last Saturday, November 1st, I finally went and what an excellent educational opportunity it was. James M. Beidler presented four sessions on the topics of Germany and Pennsylvania Research, two areas that are important to my research. The Archives of Michigan is the recipient of the Detroit News archives, including their index cards. The index cards should be available online at SeekingMichigan.org by May 2015. The Archives of Michigan has been working over the past year on making naturalization records available online as well. The index will be made available to Family Search and the actual images will be at Seeking Michigan. See what has already been indexed, here. Currently, Seeking Michigan has images of Death Certificates from 1897-1920. It was announced a while ago that more certificates, 1921-1952, would be available at Seeking Michigan. Genealogists kept hearing they would be available soon. There have been a couple of glitches getting those records online. Saturday, we heard they would be online soon! They are coming. Michigan imposes a 75 year restriction on access to death records and when the next group is released it will be for years 1921-1938, 1939 if not released until January. James M. Beidler was introduced and started his first presentation, Contrasting German Migrations: 18th vs. 19th Century Waves. James took participants through the scale, geography, motivations, religion and economic class of the immigrants arriving in these two distinct periods of German immigration. The second session was on Pennsylvania Church Records, which are very desirable records for research of Germans who came to America. Overview of the denominations (Lutheran, Reformed, and Moravians), types of records available, where the records are kept, general tips, and resources were provided. During lunch I took advantage of a tour of the Archives of Michigan. Kris Rzepczynski led the tour, which included a behind the scenes look of the Archives. I hadn't been to the Archives since the Abrams Collection was relocated to the Archives. I thought the Archives seemed more user friendly than the last time I visited. The tour was followed by eating lunch and a visit to the Michigan Historical Center's store. James Beidler's books were available for sale, but I already had both of those, so I bought "Among the Enemy" a Michigan civil war soldier's journal. I even picked up a Christmas gift for someone special. 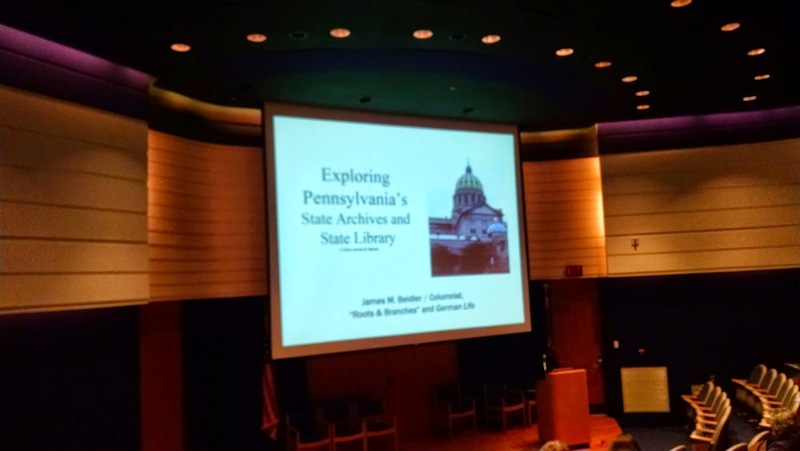 Exploring Pennsylvania's State Archives and State Library was the topic of the next presentation. Details were provided on visiting the archives and library and the marquee resources available. The fall history event ended the day with a session Success Story: Finding a European Village of Origin. Using a case study of Johannes Dinius, James showed how piecing together all the research pieces can lead to a hometown of your immigrant ancestor. Throughout the day, Beidler, showed records and maps to enhance the presentations. He wove stories and humor throughout the day to make the sessions enjoyable. If you are looking for a great genealogical educational opportunity put the Fall Family History Event on your calendar.